I work yesterday in a studio in midtown and every time I went out to do various and sundry things, i.e. go to the bathroom I past this sign. At first the the big Life is a Team Sport caught my eye which I thought was fantastic. But then I noticed the #Live With Fire. Now I know it is covered by computers ( I was unable to move then for the picture) but I can’t stop thinking about it. It’s akin to the thought that I regularly say, Play full out! Though there is something about #LiveWithFire that has an air of hunger and of passion for me! So I am asking myself how can I #LiveWithFire in ways that I’m not doing. Where am I not showing up completely? 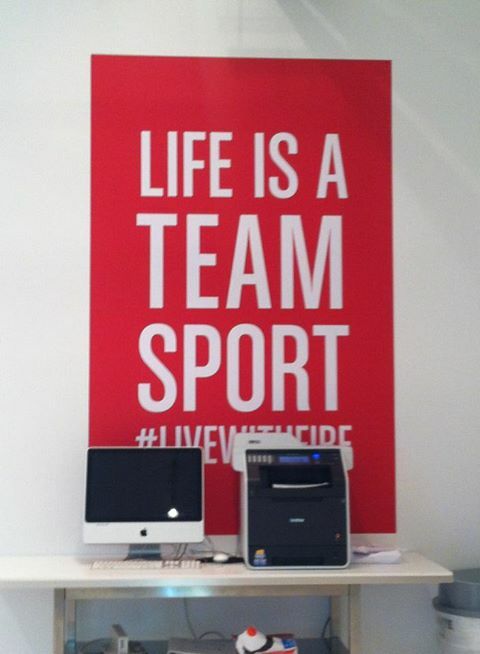 What can you today to #LiveWithFire! Have fun with it!! I think it’s going to be my new favorite saying! Thank you Location 5 studios!